This Friday we bottle the 2009 Stomping Girl Pinot Noir. So much preparation goes in to this one day (design and print labels, get federal approval for labels, order capsules and corks, find workers [thanks volunteers! ], line up warehouse to store bottled wine, etc. etc, but the most important thing is always the wine. 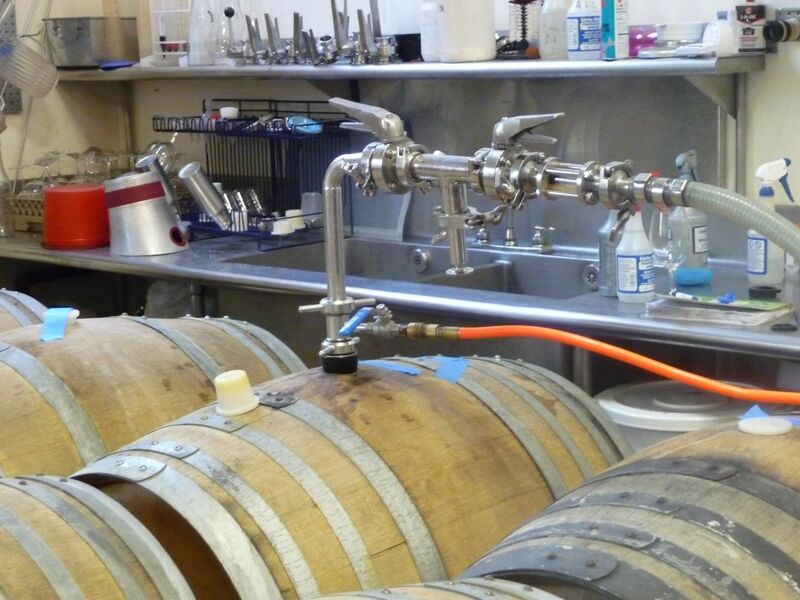 We sample and blend wine, decide which barrels are ready to bottle, run lab test on the wine to determine alcohol level, ph, etc., and we rack the barreled wine off the lees. To do this, all the barrels are moved to the floor of the winery, no small feat in a small space, and the wine is pushed through hoses into large stainless steel tanks using argon gas (see picture above.) Then the wine is allowed to settle for a while before its big day. It is our last opportunity to taste and make any adjustments before it goes into bottle. Or as someone (wise?) once said, this is last opportunity for the winemaker to screw up the wine.